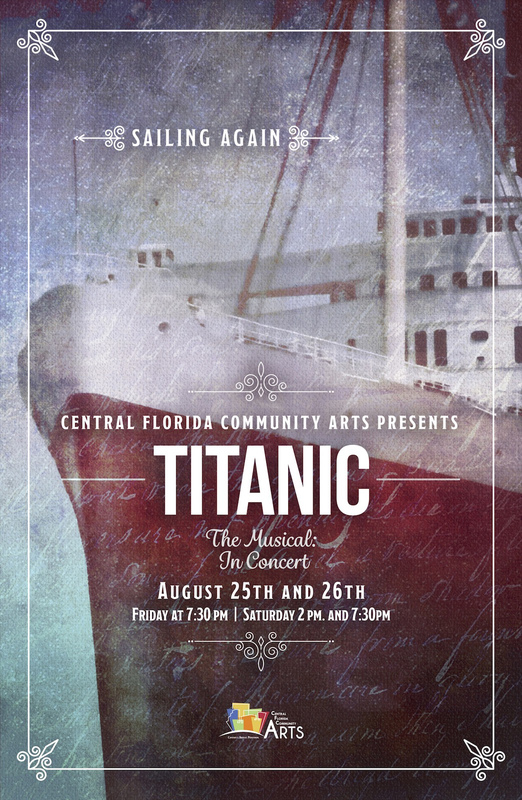 Central Florida Community Arts presents the Tony Award-winning “Titanic The Musical: In Concert,” featuring music and lyrics by Maury Yeston and a book by Peter Stone. Following the events of the ill-fated maiden voyage of the RMS Titanic, this musical captures the stories of the people on board the legendary ship, spanning across all classes and decks. This concert production will feature a stellar cast of local Central Florida actors, a nearly 100-voice choir, a 45-member orchestra and a unique style and staging only Central Florida Community Arts can create. Don’t miss this powerful and moving presentation as Titanic sails again this August! “Titanic The Musical: In Concert” will be held Friday, August 25 and Saturday, August 26 at Calvary Assembly, 1199 Clay St, Winter Park, FL 32789. We are offering the convenience of assigned seating for this event! That’s right, you will be able to CHOOSE YOUR SEATS when you order your tickets. All seats in the auditorium will be assigned and will not be first come, first served. So buy your tickets now! Tickets are $10 each for Advance General seating, $15 Prime Seating, $25 Priority Seating, and $50 for Premium seating (which also includes a CFCArts Cookbook and Autographed Poster). Balcony seating is not handicapped accessible. For handicapped-accessible seating, please call the CFCArts Box Office at 407-937-1800 x 710. Children ages 3 and under will be admitted for free. For parents wishing for children to have their own seat, a free ticket will be available for reservation. Ticketing questions? Contact the CFCArts Box Office: 407-937-1800 x710 or BoxOffice@CFCArts.com. August 25 at 7:30 p.m.
August 26, 2017 at 2 p.m.
August 26, 2017 at 7:30 p.m.